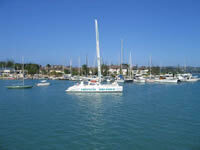 Located on the Freeport Peninsula, this is where all the boating and yacht action is found. Inexpensive dock rates for visiting vessels are available as well as charter boats for touring and fishing. The adjacent club house within the yacht club offers excellent dining in the restaurant, a full lounge/bar, changing rooms, water, diesel and rooming accommodations for two to six people. Grocery and liquor stores are also within close proximity to the club. Area restaurants have free shuttle service from the marina if you decide to dine off the property. Check the schedule for races, fishing tournaments and other special events that come through here. Montego Bay Yacht Club is a sociable institution with a full calendar of competitive and fun events. Top of the bill comes the Easter Regatta, with a feast of maritime activity in the beautiful surroundings of Montego Bay. Visitors can join in (local yacht clubs are invited) or take the leisurely option of watching from the harbour. The first leg of the event is a race to Mosquito Cove, marking the commencement of a series of races in various classes held over the Easter weekend.